(a) Fully pull the parking brake lever to engage the parking brake. (b) Release the lever to disengage the parking brake. (c) Slowly pull the parking brake lever all the way and count the number of clicks. If the parking brake lever travel is not as specified, adjust the parking brake shoe clearance and parking brake lever travel. (a) Remove the rear console box assembly (See page ). (b) Completely release the parking brake lever. 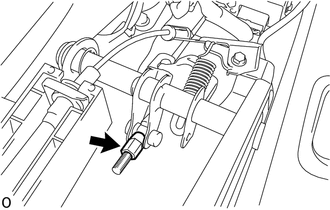 (c) Loosen the adjusting nut to completely release the parking brake cable. (d) Temporarily install the hub nuts. (e) Remove the hole plug. (f) Using a screwdriver, turn the shoe adjuster to expand the shoe until the brake drum locks. (g) Using another screwdriver, push up the automatic adjust lever and turn the shoe adjuster to contract the shoes so that the shoe does not touch the brake drum. Then turn the shoe adjuster another 180 degrees to further contract the shoes. (i) Install the hole plug. (j) Remove the hub nuts. 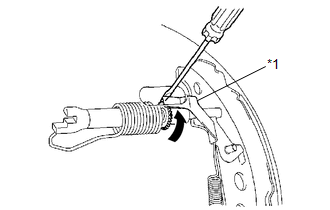 (k) Turn the adjusting nut until the parking brake lever travel becomes correct. (l) Operate the parking brake lever 3 to 4 times and check the parking brake lever travel. (m) Check whether the parking brake drags or not. (n) When operating the parking brake lever, check that the parking brake warning light comes on. The parking brake warning light always illuminates at the first click. (o) Install the rear console box assembly (See page ).